Five ropes were tested in the category of midsize ropes, which are characterized by diameters between 9.3 and 9.5 mm. These ropes are known for their balance of being lightweight, yet durable. 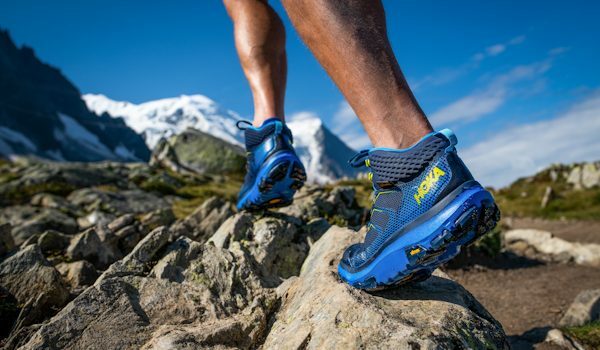 Their easy handling makes them popular for a wide range of climbing objectives, from clipping bolts at a sport crag to long ice climbs in the mountains. 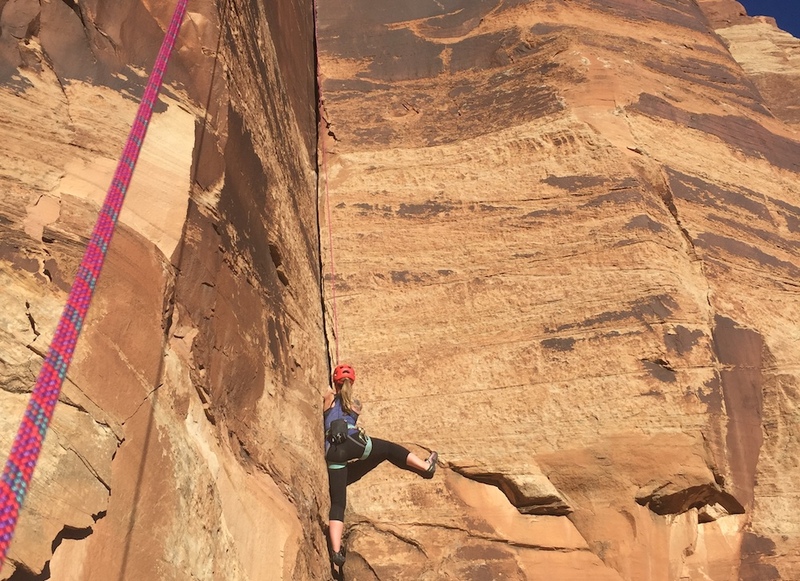 All of the ropes were used at least 25 days in the field in several environments, including desert sandstone traditional climbing, summer sport climbing and ice climbing. While going through the hands of many testers outside, the ropes were also subjected to in-house tests on an isolated section of rope to compare before and after use. Each rope was evaluated on five categories: handling, resistance to dirt, durability, features and versatility. The Edelrid Eagle Light is a durable and well handling 9.5mm rope with features and characteristics that make it a versatile and quality rope for a wide range of users. The Sterling Evolution Helix is an effective rope for trad and sport climbing with great handling characteristics for knot tying and belaying. 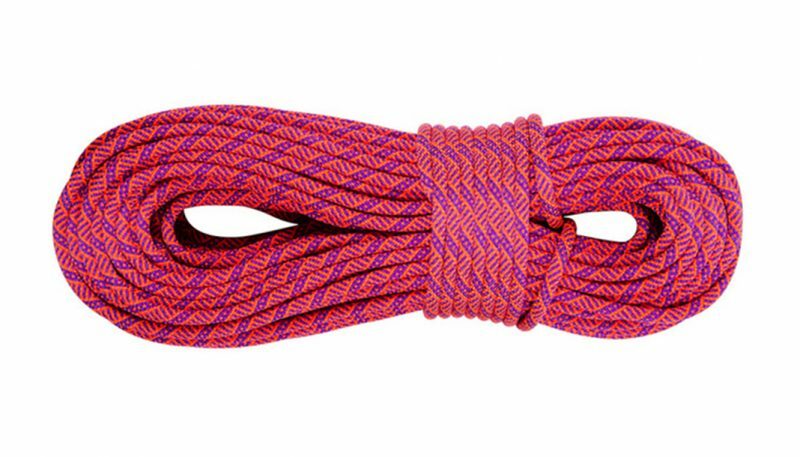 Good durability and resistance to dirt make the Helix a long lasting rope for climbers. The Helix is available with a number of options, such as dry treatment and bi-pattern. 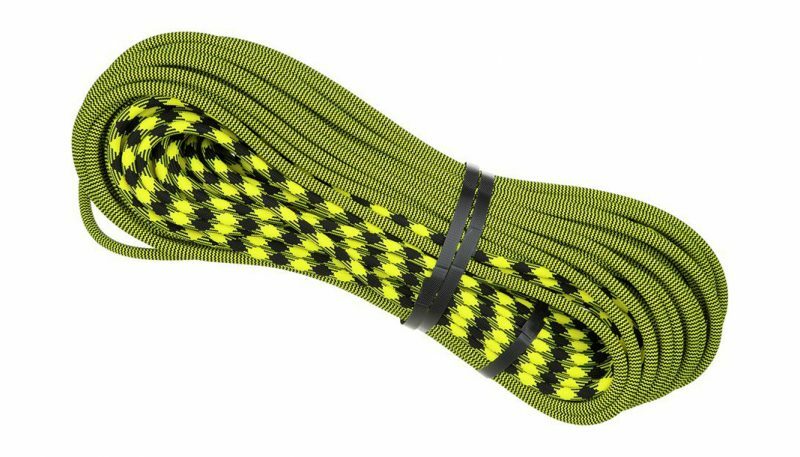 The Maxim Pinnacle Yellow Jacket is a versatile, durable dynamic single climbing rope with a bi-pattern, high-contrast color scheme that makes finding the middle of the rope easy. Maxim’s Endura dry treatment of the sheath and core work great for ice and alpine climbing and the tightly woven sheath is a little stiff but feeds smoothly for sport and trad climbing, making the Pinnacle a great all around rope. The BlueWater Wave is a 9.3 mm dynamic single and half rope with good durability and resistance to dirt. 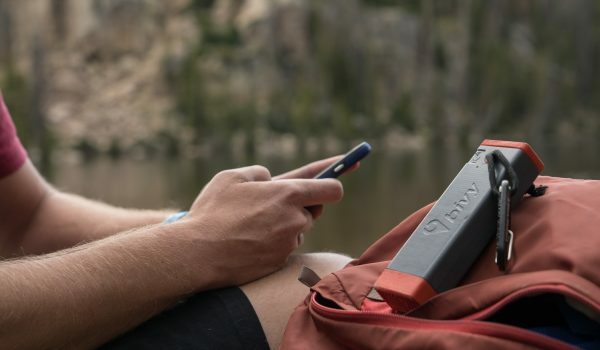 With stiffer handling due to a thick sheath, the Wave worked best in single pitch sport and trad climbing although dry treatment options make it an appealing rope for ice and alpine climbers. 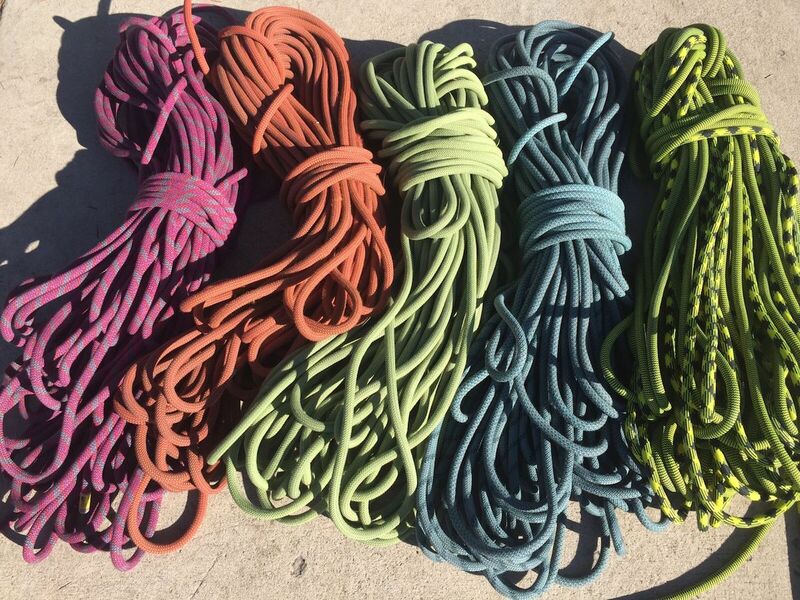 The lineup of midsize climbing ropes tested, from left to right: Sterling Evolution Helix, Petzl Arial, Mammut Infinity, BlueWater Wave, Maxim Pinnacle Yellow Jacket. 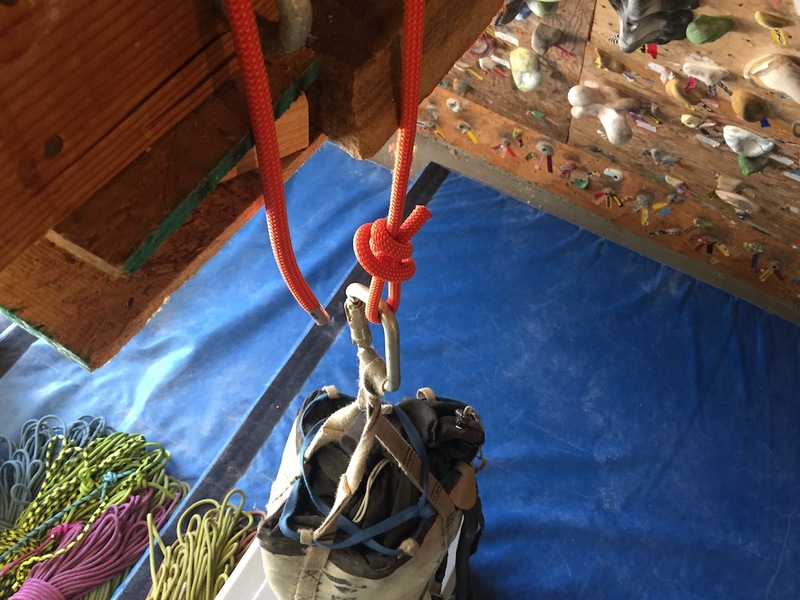 Handling is often the first thing climbers notice in a rope and it was also the topic discussed most regularly by testers. Hand is the technical term used in the industry but we’ve opted for the more everyday term used by climbers at the crag, handling. A rope with good handling should be easy to tie knots in and those knots should hold securely. Ropes popular with testers fed through a variety of belay devices with ease made clipping quick and were smooth in their general handling. A number of ropes drew rave reviews from testers for their easy handling with the Sterling Evolution Helix and Petzl Arial rated the best. The Helix was particularly soft and supple and easy to work with while the Arial proved particularly effective at maintaining its easy handling over time. Petzl would credit that to its EverFlex treatment, a thermal treatment that stabilizes the core strands to give the rope the ability to maintain its good handling after extensive use. Five midsize ropes side by side, all of which were carefully scrutinized for their ease of handling. Having a rope that holds up well to dirt gives a rope a long-term appeal, both out of its function by making it easier to spot a middle mark and in the visual attractiveness of having a rope that doesn’t look ancient and haggard when pulled out of a pack. 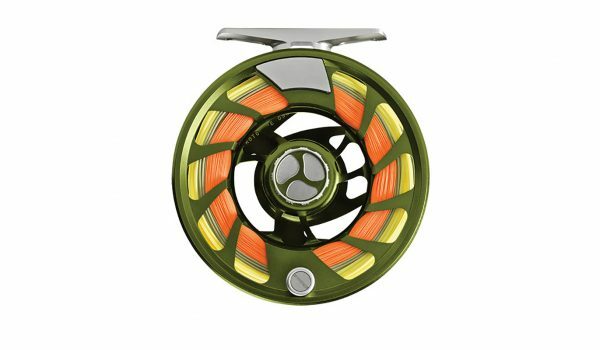 The Sterling Evolution Helix came out on top in this category although it had a couple of close contenders, the Maxim Pinnacle Yellow Jacket and BlueWater Wave. All proved to be resilient to dirt and grime picked up during extended use and abuse. For each, sections of new rope were saved to be used as a comparison as each rope was put to tough field use and testers all remarked about a rope’s cleanliness or lack thereof. The category winner, the Sterling Evolution Helix, pictured here with a section of new rope side by side with a well-used rope. All climbers appreciate a rope that will hold up to the demands placed upon it and we’ve probably all heard about a rope that was “shredded” after a few days of use on the rock. 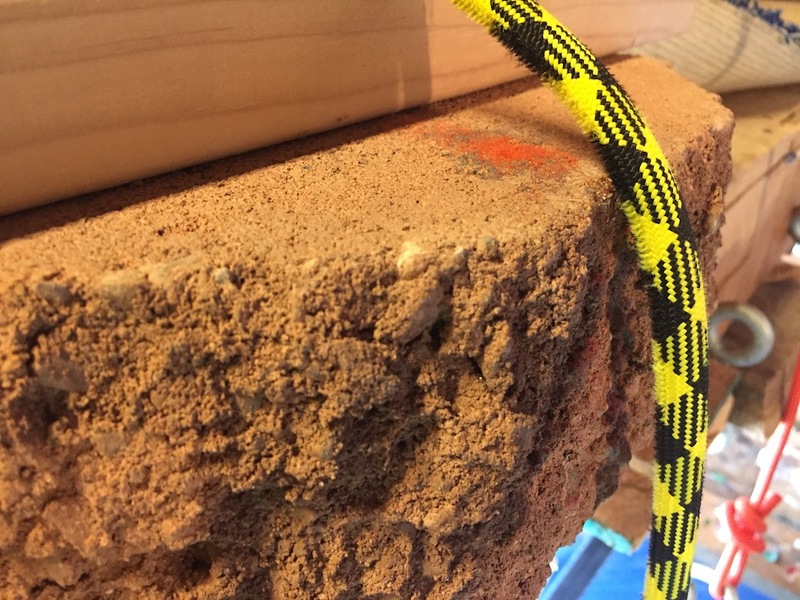 While real field testing is valuable for determining a rope’s durability, we also used in-house testing on isolated sections of new rope to determine how ropes fared. 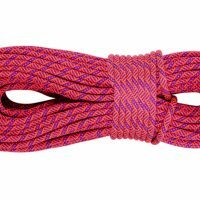 Testers were pleasantly surprised with how durable these midsize ropes were, which perhaps speaks to why this size rope has become increasingly popular in recent years. All of the ropes tested received high marks but the Mammut Infinity and Maxim Pinnacle Yellow Jacket proved the most durable. A section of new rope next to the well used Mammut Infinity, whose sheath held up well to wear and tear and good handling stayed relatively intact. If all ropes were made the same then there wouldn’t be much to review. 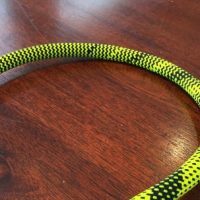 Instead, each rope has its own features that are often highly touted by companies and in the case of skinny ropes, this was certainly the case. 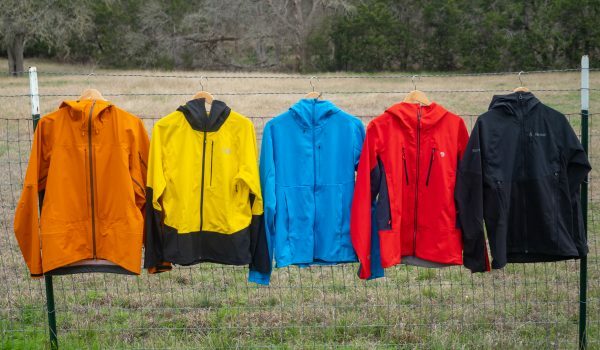 Testers were particularly impressed with the features on the Maxim Pinnacle Yellow Jacket. 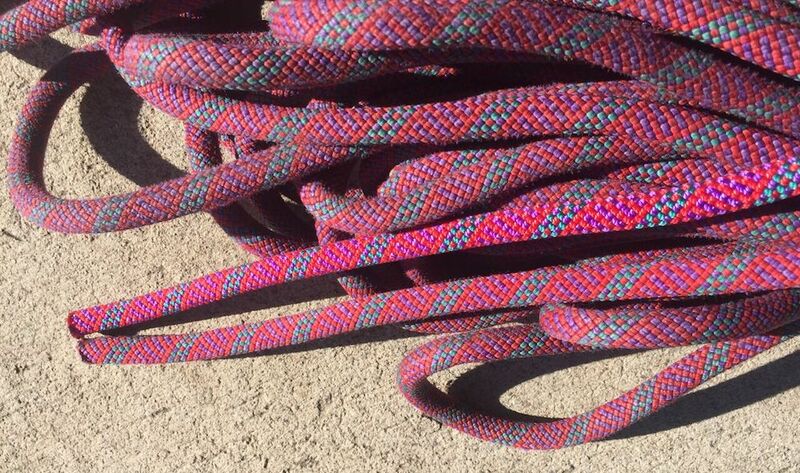 Available with an effective Endura Dry-treated Core with a number of colors, the feature that stood out was the particularly effective bicolor pattern scheme that has been the easiest bicolor pattern used in ropes we’ve tested. 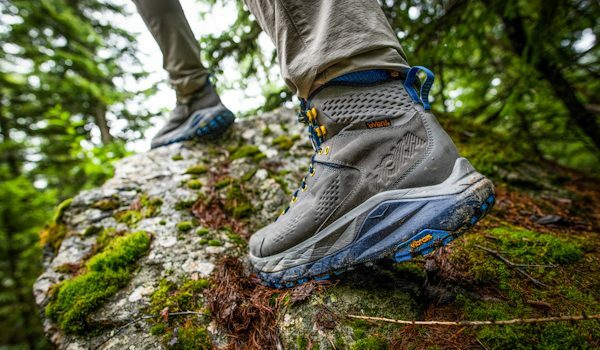 Close behind the Pinnacle, testers gave high marks to the Mammut Infinity’s effective dry treatment and the many options available with the Sterling Helix and BlueWater Wave. The BlueWater Wave is available in many iterations, including a bicolor pattern scheme which was effective at finding the middle mark but not as effective as the category winning Pinnacle’s bicolor pattern scheme. The versatility of a rope to perform well in a wide range of climbing styles can give a rope great appeal to be less of a one-dimensional rope and closer to a quiver of one rope. 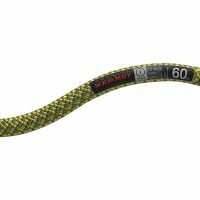 While all of the ropes tested had broad appeal and versatility, the Maxim Pinnacle Yellow Jacket was a solid step ahead of the others owing to its effective dry treatment, popular bicolor pattern scheme, and rugged durability. In a competition to be a quiver-of-one rope, testers felt the Pinnacle came the closest to being a climbing rope that would satisfy climber’s needs for cragging, multi-pitch and winter objectives like ice and alpine climbing. 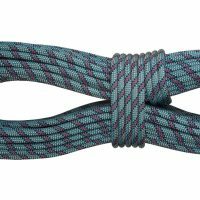 Our test results came after dozens of days of field testing on desert towers, limestone sport climbs, long alpine routes, and freezing through cold belay sessions while ice climbing plus hours in the garage handling ropes, tying knots and repeatedly hauling a heavy bag to test the durability of each. 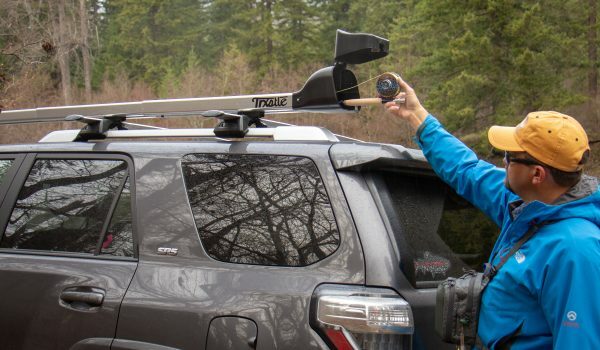 It was a close competition with clear winners in individual categories but the Maxim Pinnacle came out on top, favored by testers for its durability, features, and wide-ranging versatility. The Sterling Evolution Helix was popular with testers for its easy handling and resistance to dirt. The long-term handling characteristics maintained by the Petzl Arial was a hit while the rope was also appreciated for its good versatility. The effective dry treatment and great durability of the Mammut Infinity helped the rope work well for both ice and rock climbing. 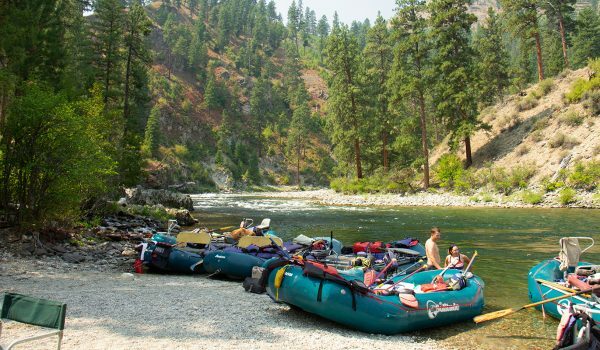 Finally, the BlueWater Wave was appreciated for its durability and features. This middle size range of ropes was, in general, popular with testers for the balance between weight and durability they offer. 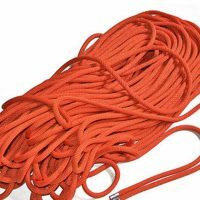 Not quite skinny ropes but a long way from the thick 10.5 mm cords popular in the past, these midsize ropes are great for a wide range of climbing objectives such as single pitch sport, long multi-pitch routes or winter days on the ice. 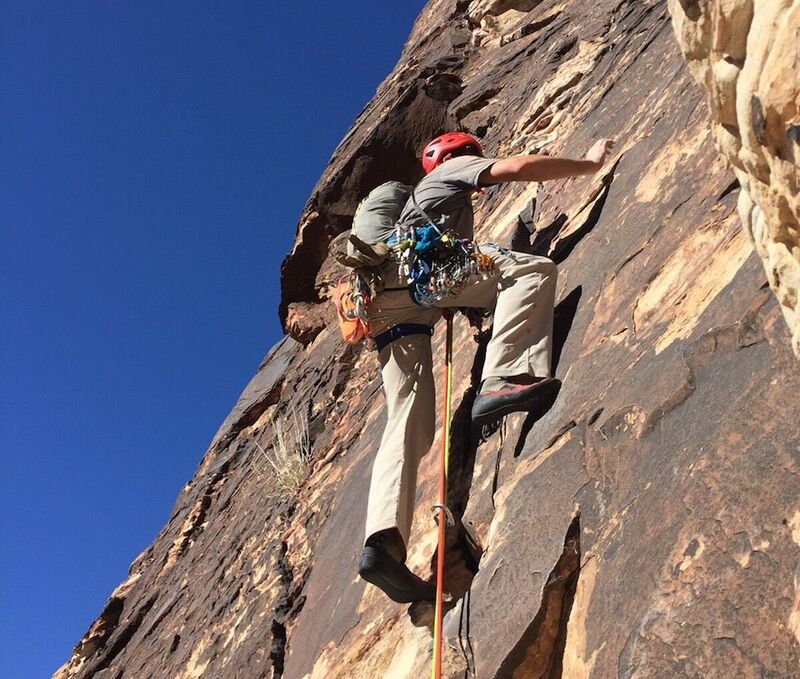 Putting ropes to the test in the field, the Petzl Arial and Mammut Infinity while guiding a multi-pitch climb in Red Rock, outside Las Vegas. For testing, we put these ropes through the wringer, subjecting them to dozens of days of sport, trad, and ice climbing on a variety of rock types, including granite, sandstone, and limestone. Our before and after pictures show how the rope held up to dirt with a section of new rope compared next to the well-traveled rope. 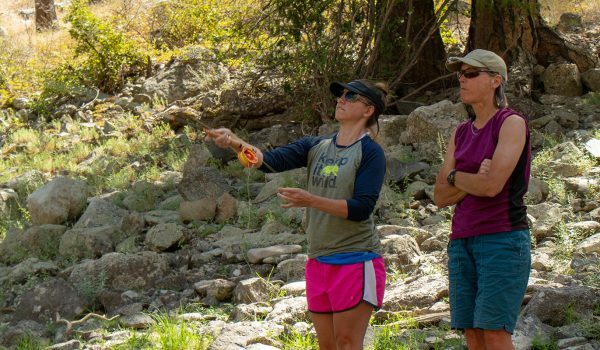 Numerous climbers of varying experience plus guides, clients, and students gave feedback on characteristics like handling. We’ve used the term “handling” instead of the more appropriate term “hand” because I don’t think I’ve ever heard hand used at the crag. We also took that new section of rope and put it through some in-house testing to judge the rope’s durability. With a haul bag weighing 55 pounds, each section of rope was run repeatedly over a rough edge as an abrasion test and then moved side to side along a sharp edge. That new section of rope was also used to compare the rope’s condition in terms of durability and resistance to dirt after extended use. 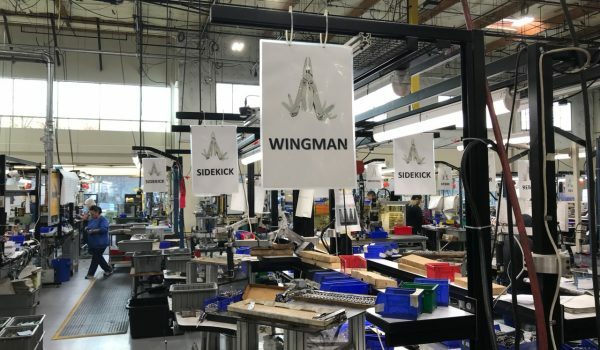 Additionally, each rope was rated on features included in its manufacturing and the rope’s ability to be effectively used across a wide platform of uses to give the rope a versatility rating. Most ropes today feature middle marks and testers rated each rope for the presence of a middle mark and how easily it was visible, both new and over time as the rope picked up dirt and wear and tear. Ropes could receive higher marks for having a variety of colors or length options or if it came in a bicolor pattern option and how effective that bicolor pattern scheme was. A rope’s dry treatment and how well it worked was judged and was another key component of a rope’s features rating. Testers also rated a rope’s ability or preference to be used in a variety of climbing styles. Putting a section of rope through an abrasion test. The sharp edge test uses a piece of sandstone with the rope weighted with a 55-pound haul bag. A section of new rope next to the well used BlueWater Wave to gauge its resistance to dirt and field durability. What is a Midsize Rope? 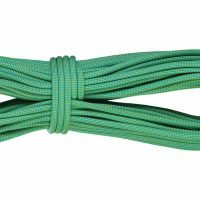 The midsize rope has become one of the two most popular rope diameters according to online retailer Backcountry.com. The first time I added a midsize rope to my quiver was only because my mother-in-law wanted to buy me a rope. 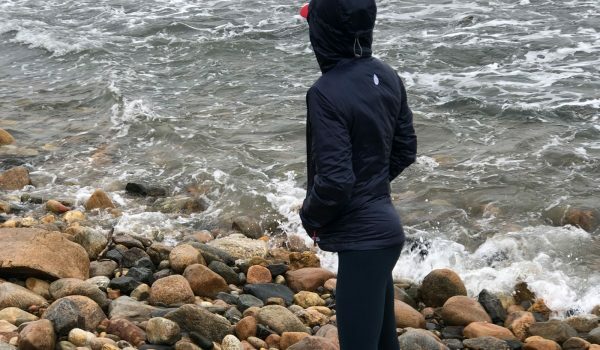 Worried that I would be wasting my money by buying a thin rope that would quickly get shredded on the rock, I happily used her credit card when she offered. That rope performed admirably for a few years and I quickly fell in love with the lightweight and favorable handling characteristics. Today, you see a lot of climbers using midsize ropes for daily sport cragging, long multi-pitch routes, or out on the ice. Testing the Sterling Evolution Helix while climbing in Colorado National Monument. 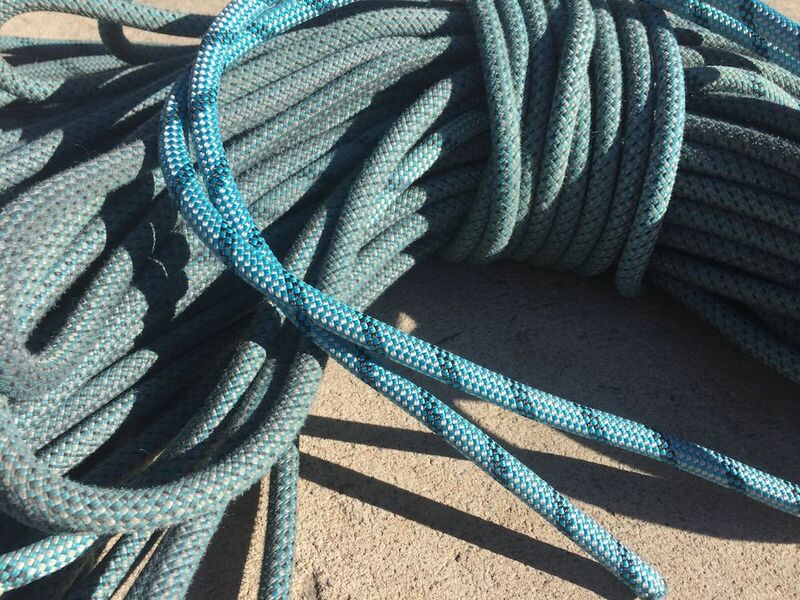 Midsize ropes still have their limitations, as any rope will, as they too can get shredded on sharp rock or if run over an edge. 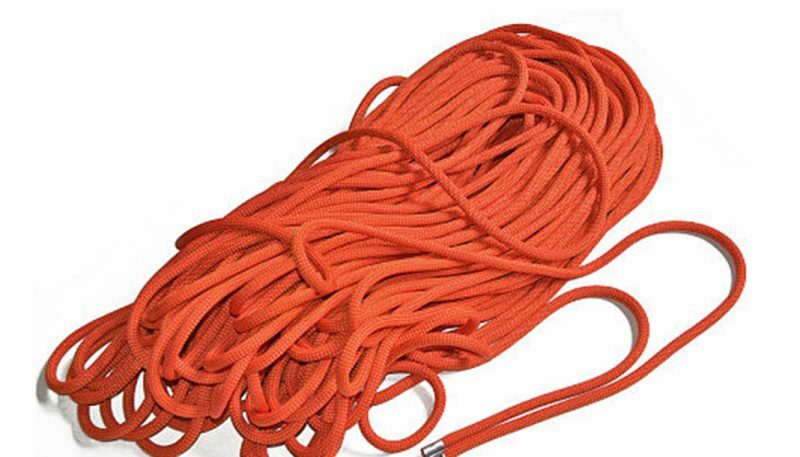 One of the reasons companies have been able to make smaller diameter ropes while still being able to pass UIAA tests is that they’ve taken material out of the sheath. 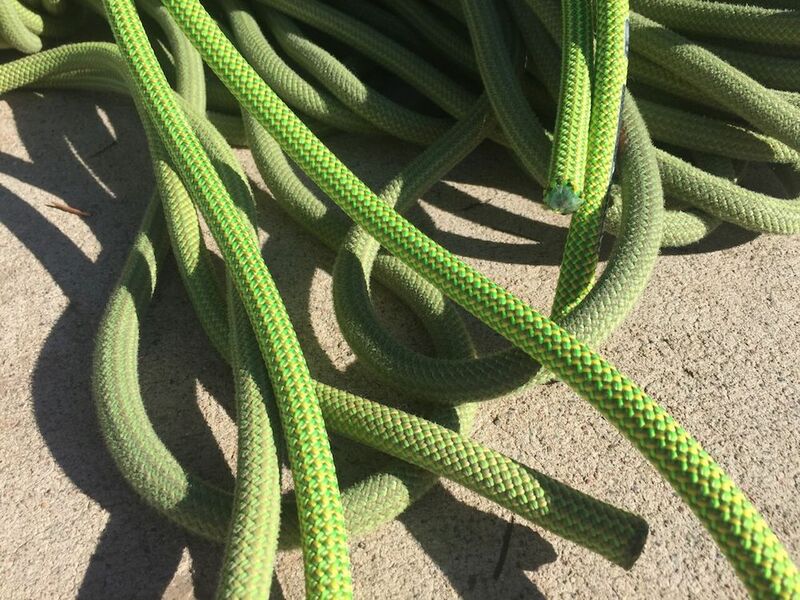 Hence, some durability is lost although many climbers appreciate the easy handling and soft, supple characteristics of the midsize ropes, as our testers did. Ropes in this 9.3 to 9.5 size range aren’t workhorse 10.5 ropes that are going to hold up to repeated abuse and are more favorable for use where handling and lightweight are key and durability is less important. 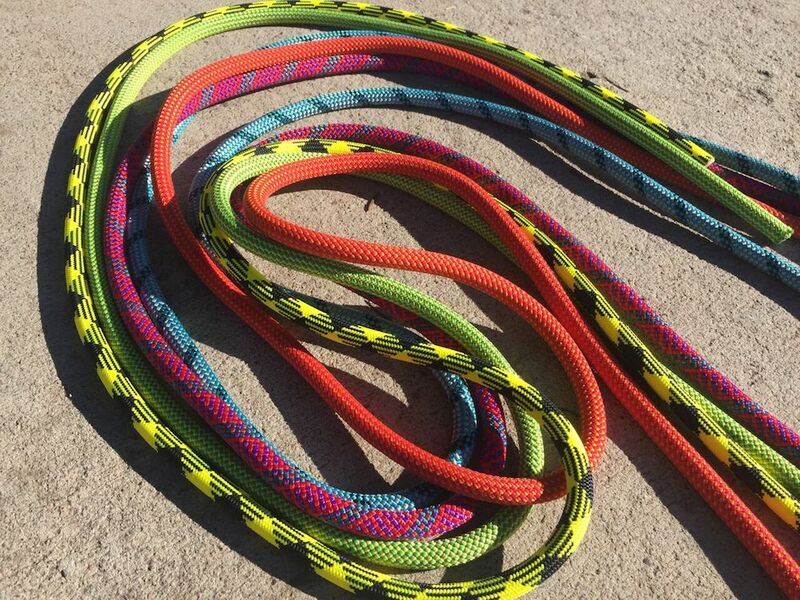 In the guiding and instructional world, these midsize ropes are seen as great for multi-pitch routes and ice climbing days but not as ideal for the large group setting that is going to be hanging and swinging around on topropes all day, that’s where the thick (9.7-9.9 mm) ropes or larger come into play. 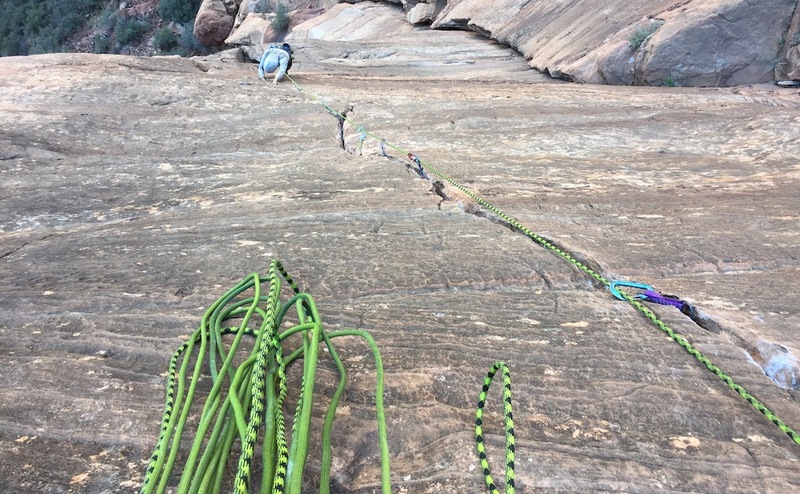 The versatility of the Maxim Pinnacle Yellow Jacket being demonstrated on a multi-pitch climb in Zion National Park, Utah. At one point in time, skinny double rope systems were popular with many ice climbers. Today, that system is less popular although still used by some on long routes with multiple rappels. 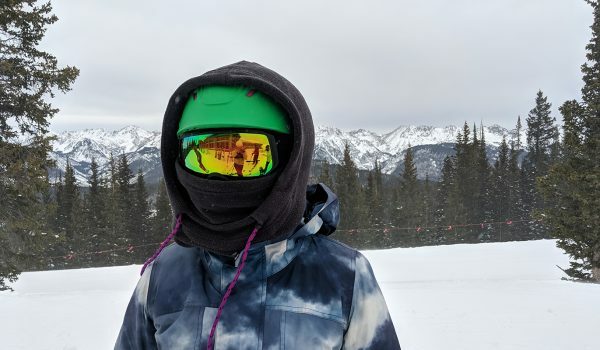 Instead, most ice climbers are seeking out dry treated ropes where durability is less of a concern and the handling and effectiveness of the dry treatment are more pressing. Evidence of that is all of the midsize ropes tested automatically come with or are available in a dry treatment, some of which are touted as being more effective dry treatments and include treatments of both the core and the sheath. 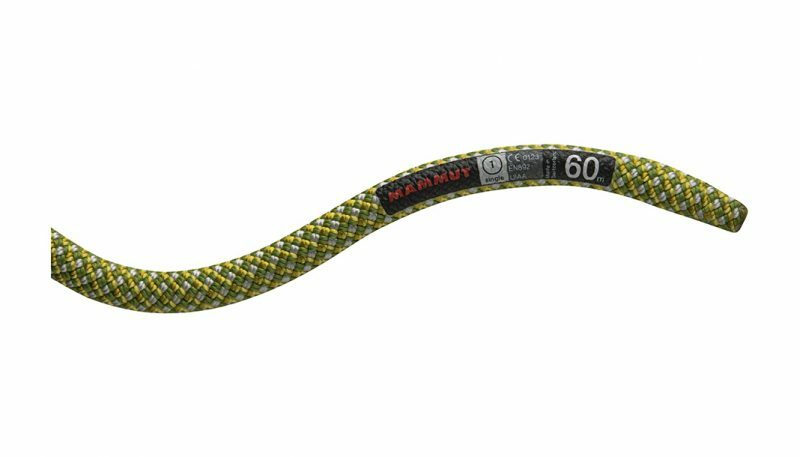 Mammut’s Infinity 9.5 mm rope was the first rope advertised a being able to pass the new UIAA dry rope test, by which a rope cannot absorb water more than 5 percent of the rope’s weight. 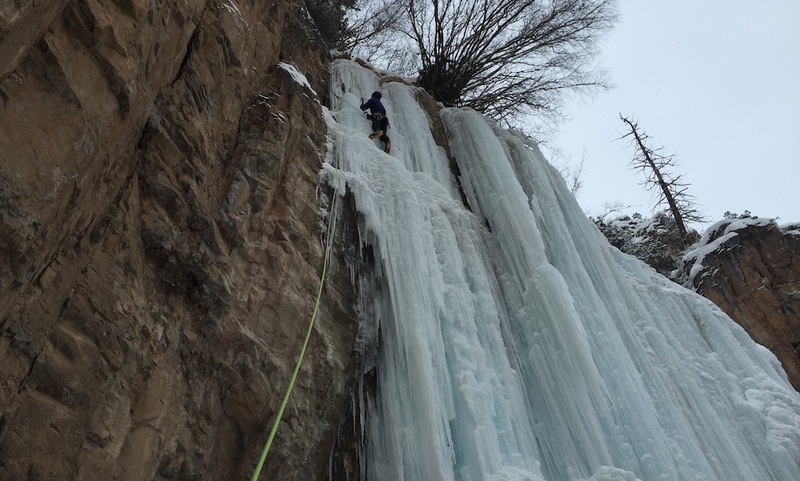 The dry treatment of the Mammut Infinity being put to the test on an ice climb in Rifle Mountain Park, Colorado. 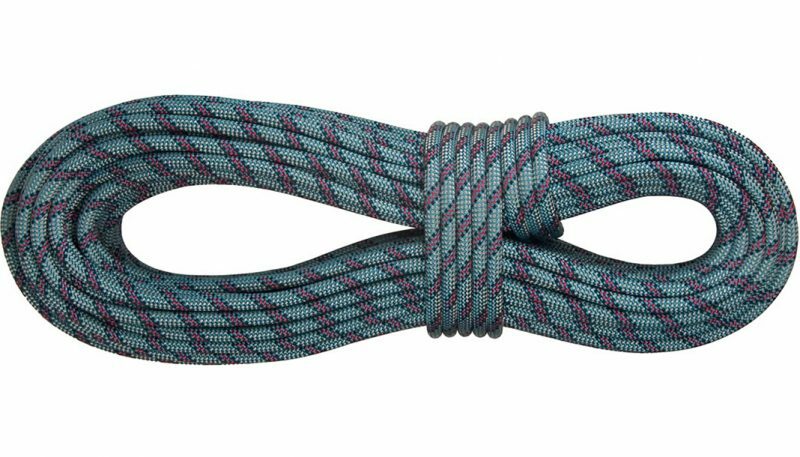 The midsize ropes on the market today share many traits but also differ in the features they offer and the styles of climbing where they work best. All of the midsize ropes had reasonably good handling although a few stood out. 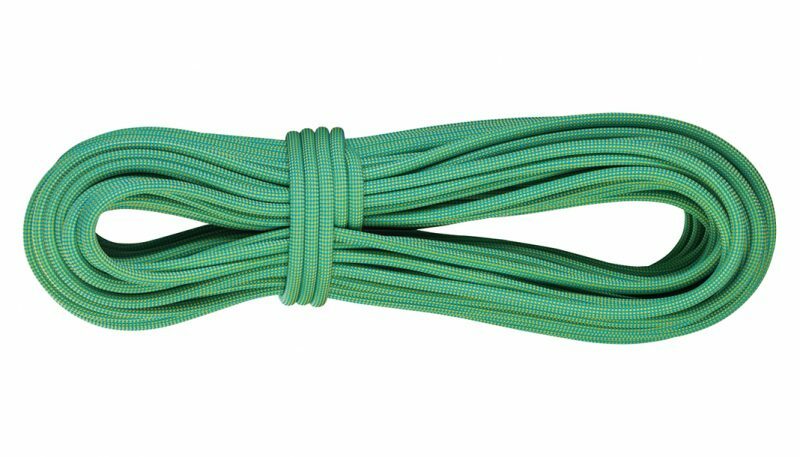 Good handling and not fighting kinks in the rope make these midsize ropes popular for multi-pitch climbing, enhanced by their greater durability than skinny ropes and weight savings compared to thicker ropes. 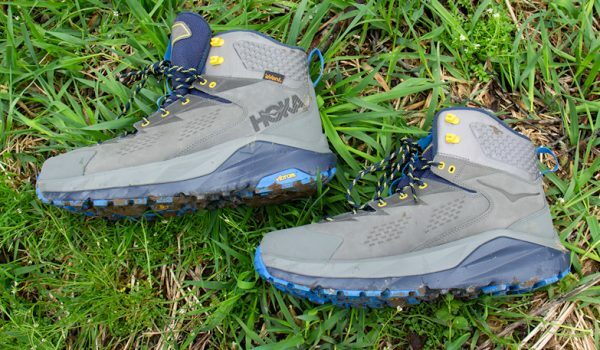 On top of handling, the durability and resistance to dirt make the midsize ropes popular for cragging although ropes like the Sterling Helix stood out in this regard. 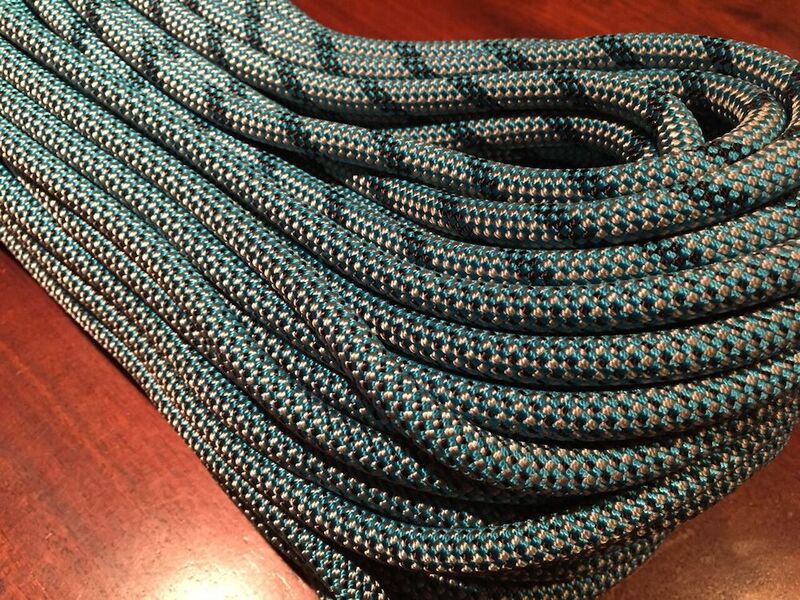 Most of these midsize ropes run about $200, depending on features chosen with one, the BlueWater Wave, available for just $160 for a 60-meter standard. On the other end of the scale, the Maxim Pinnacle Yellow Jacket will set you back $283 for a 60 meter 2x Dry version.